Jabra is known for making quality products, and the Solemate is no exception. Having been founded in Utah in 1983, Jabra has continually provided superior products to people around the world. As this Jabra Solemate review will show, one of Jabra’s more expensive offerings manages to bag a top spot. This is even when it comes to some more expensive alternatives. The Jabra Solemate is designed to be one of the best. This Jabra Solemate review will treat it as such and compare it to other products in the same class and price range. The first thing you are going to notice with this model is the price. Criteria are going to be pretty basic for this. What you are probably looking for is a reliable speaker with better-than-average sound quality - due to the price tag - and a few extra features. Being able to fix your speaker to something without fear of it falling off, is usually a feature of speakers from this segment of the market. You are also probably looking for some level of control on the speaker itself. Design-wise, the Solemate is more of a minimalist option. If you are looking for a flashy or flamboyant speaker, you are probably looking at the wrong product. The design highlights practical concerns over those of fashion. The black and rugged casing gives it the feeling of being able to stay together for a long time. Additionally, the base is shaped like teeth on the sole of a shoe, which can be used to ensure the device will stay fixed in one location and not slide away. This is great because the Solemate is pretty light (21.5oz). The sound is expelled through a 10 watt speaker system, which is constituted of 2 acoustic tweeters and 1 powerful subwoofer. The Jabra Solemate also includes a Jabra proprietary passive bass radiator. This will make sure your sounds go bump. The device is capable of generating over 120 dB of sound, which is more than even the loud-sounding UE Boom 2. Other features on the Solemate include an inbuilt battery capable of 8 hours of continuous music playing, or 40 hours of standby time. You will also be provided with a small and durable bag for easy transport, or you can use a supplied clip to attach the speaker to something. One further point, the device is primarily a Bluetooth speaker, but if you need, you can use a provided 3.5mm jack to plug it into your device. Design – The design may be minimalist, but it sure does make the Jabra look sleek and efficient. It isn’t going to turn any heads, but it is going to reassure you that you have bought a quality product. 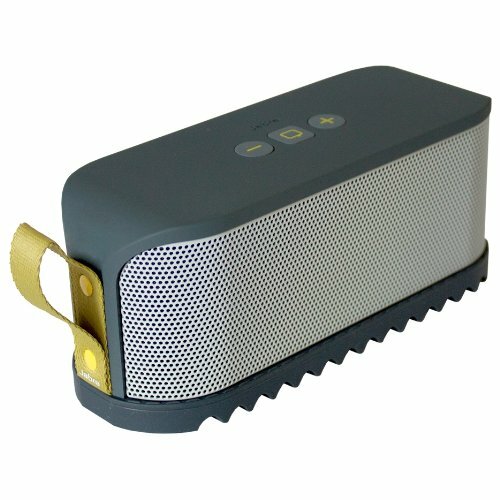 Volume – I cannot believe how loud this Bluetooth speaker can get. Even compared to more expensive alternatives on the market, for this speaker wattage, this is one of the best. ​Proprietary Bass technology – If you, like me, have some music which tends to ‘bump’, then Jabra’s bass technology is basically unrivalled. Compared to the alternative, Jabra again manages to come away with some of the best results. Brand – Jabra is a reliable and long-standing brand. They are popular around the world, and people are probably going to recognise who has made this speaker when they see it. Whether this is good or bad is up to you. Battery life – There are no real cons I can find with this product, so this is more of a quibble than a real issue. Regardless, the battery life is marked down as being 8 hours, but this is at average sound levels. If you want to make this speaker really shout, then you are going to be using a lot more energy. The added energy consumption is going to mean this guy won’t last nearly as long. If you are interested in the other finalists in the loudest bluetooth speaker category. Check out our information.